The latest U.S.D.A. 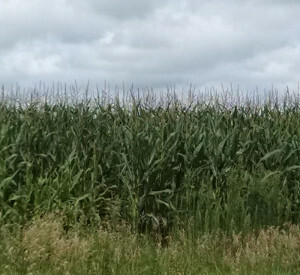 report on Iowa crop conditions indicates the harvest will soon begin in earnest. Twenty-eight percent of Iowa’s corn crop was rated “mature” by last Friday. That’s a week ahead of the five-year average. The state’s soybean crop is nearing maturity, too — about five days ahead of the average according to the U.S.D.A. Despite widespread rain last week, the USDA reports some seed corn was harvested and some farmers were able to chop corn down for silage. The U.S.D.A. report indicates the state’s soil has been saturated with the recent rains and drought concerns eased in south central and southeast Iowa. Just four percent of the state was rated short or very short of topsoil moisture last week. The rain did delay hay production by more than a week behind last year’s pace. The state climatologist reports two-day rainfall totals for Monday and Tuesday of last week averaged above an inch in 75 of Iowa’s 99 counties.